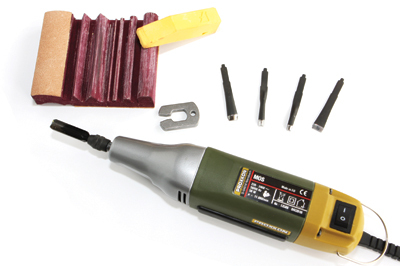 For those of us who don't mind calling on a bit of power to assist with our carving endeavours, there is a wide range of very useful power tools on the market these days for us to choose from. From rotary units, angle grinders and sanders, to multi tools, saws and sharpening units, there is something that every carver will find useful during the various stages of the carving process. And there are even motorised carving units which allow you to attach specialised gouges, the Proxxon MOS Carver being one of them. This unit comes packaged with four Flexcut RG blades - No.3 3/8in, No.5 5/16in, No.11 1/8in and a 70° V-tool 1/4in - and a Flexcut slipstrop. 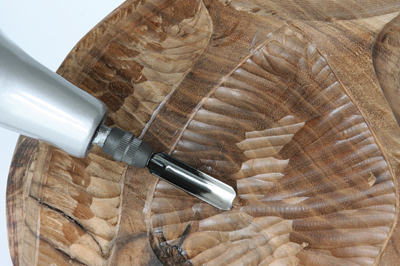 Coupling a versatile carving unit with some of the best blades available, could this be a winner? The balanced 50W motor produces very little noise - only when pressure is applied to the blade does the internal mechanism operate, converting the motor's rotary motion into reciprocating motion. Fitting the cutting blades into the shaft was a simple push and lock action using the tool provided. My first instinct was to hold the tool by the aluminium housing, but in use this soon became fairly hot, forcing me to use the tool as the manufacturer had intended. Gripping the body of the carver enabled very good control of the blade, allowing the cut to be easily started and exited by lowering the tool body, leading to tireless operation over long periods. Fine details can be achieved fairly easily by placing the blade at the beginning of the cut and applying light pressure - the mechanism only begins moving the blade in short strokes until more pressure is applied, resulting in greater control. I used the carver on various wood types over the test period and found, as expected, harder woods needed more pressure of the blade, but control was still maintained. I found it was easy to make exact cuts with very little practice. It was comfortable to hold for long periods, and may be the answer for those suffering from poor grip, due to its full palm of the hand holding style, and light weight. Obviously not intended for roughing out, this unit excels at shaping and detail work. The MOS carver is good in my book, coupled with the RG blades - yes I think it's a winner!